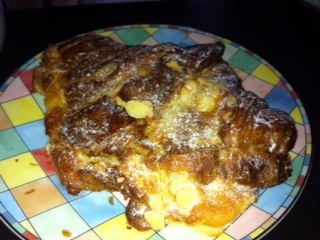 Not that we are trying to entice anyone out here … but just as a word of warning I reckon the almond croissants way at least a kilo each! With an fairly early boat from Portsmouth at 08:15, we didn’t want to be late, but with the very rigid rules of the camp site the gates weren’t opened until 7am. This turned out not to be a problem as the traffic was OK.
Unsurprisingly the motorhome was pulled over for an inspection on the UK side before boarding the boat. It was a fairly routine check, though with a Teddy bear sitting in the passenger seat it could easily have gone another way. A steady journey of about 2 hours saw us arrive in a drizzly Bagnoles de L’Orne. The house is as lovely as we remembered it, though getting the motorhome onto the driveway was a bit of a tight squeeze. We had an afternoon trip to Chichester on the train. It’s got a pretty centre with the cathedral and an old city wall which is about 1.5 miles around. After speading a few days seeing both sets of parents, staying in the motorhome of course though being well fed :), we arrived at Lancing in West Sussex (£17.50/night plus electric on a £1 coin meter). Although we had a hard standing pitch, as it had rained the night before there was definitely some sitting water. With a bit of slipping and sliding of the front wheels we managed to reverse straight onto the 2 concrete strip. Keith managed to go to watch a Brighton football game with Lee Costin. The Amex stadium is fantastic, though unfortunately this time it was Ipswich that took the honors 2-0. We caught up with Lee and Miranda both on Saturday night and Sunday lunchtime; we were lucky on the sunday as we had just gone inside to Shoreham airport for some tea/coffee and cake when the skies opened for a hail storm which briefly left the ground white!!! We chose this site so that we could pick up Gail’s dad from one of the Oxford hospitals. However, it is a great location to explore the beautiful city of Oxford; I’m sure I’ve been here before briefly but didn’t remember anything about it!!! The first loaf reminded me of a scene in ‘About a boy’ when Hugh Grant witnessed the killing of a duck with a loaf of bread…. however we have refined our bread making skills and have now (albeit with one batch in the middle reminding me of some kind of drop scone…. 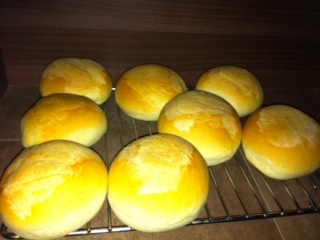 no sorry, dropped scone) sucessfully made several batches of rolls….